Two Old Men Eating Soup is part of the Black Paintings sequence created by Goya in his country villa Quinta del Sordo (Villa of the Deaf) from 1820 onward and painted directly onto the walls of the rooms. As a rather fitting choice, the artist decorated his dining room with the image of the two men eating. This death-like portrait with the faceless gazes and the head of the right person reduced to the skull are reminiscent of representations of death personified, as seen in many pictures in the Renaissance and classic art. Both life-sized individuals look and point outside the boundaries of the picture. Are they pointing to Goya at the table with them? Symbolic of death: the artist, who is marked by age and illness, is to be next in the series? The painting was created using a wide brush. The heads and hands of the two old men have a relief-like depth to them. The brush strokes themselves are so forcefully applied that they reinforce the three-dimensional appearance of the characters. 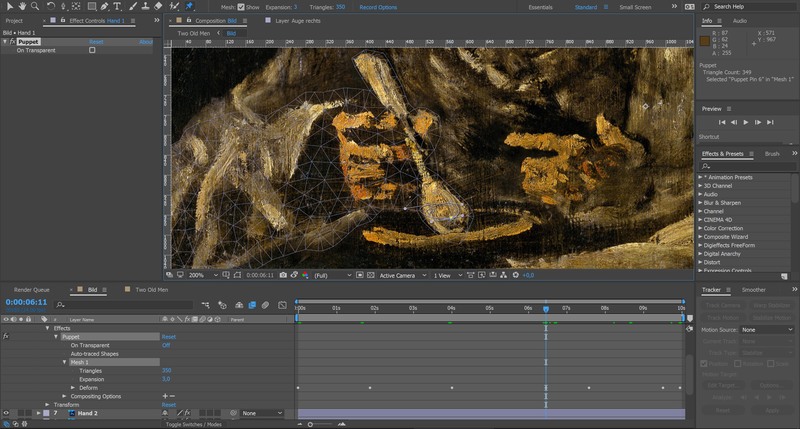 The animated realisation is used to further carve out the spatial effect of Goya’s painting and the hands pointing towards the unknown. The first step is performed in Photoshop where the image components are separated from one another and the background layers are retouched. A total of eleven layers are created, some of which were already prepared for using the puppet tool in After Effects. Two variants are created for the head of the person on the left: one using a depth mask for creating the relief, and a second variant – a simple 3D model. The Photoshop file is imported into After Effects as a composition to ensure the layers can be processed in their original arrangement and further edited as needed. The relief-style head then replaces the corresponding Photoshop layer, while the remaining elements – primarily the hands – are animated using the puppet tool. Hofmann, Werner: Goya: Vom Himmel durch die Welt zur Hölle. Stuttgart 2003. Myers, Bernard: Goya. London 1964.